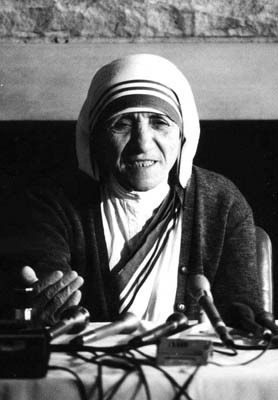 Mother Teresa speaking at Bellarmine in 1982 (© Bellarmine University). This Sub-Section includes papers collected by Lou Torok of his correspondence and friendship with Mother Teresa of Calcutta (Saint Teresa of Calcutta, M.C.). While serving a prison sentence in Kentucky the last decade of his life, Lou Torok petitioned a number of United States governors to proclaim October 7 (some chose another day) as Love Day. October 7 was the anniversary of the day Mother Teresa received permission to establish the congregation that would later be known as the Missionaries of Charity. The Missionaries of Charity observe October 7 as a special day of prayer for those who were hungry, suffering, or abandoned. The collection contains mostly original copies of the gubernatorial proclamations of Love Day in the mid-1990's from various states. There are also writings by and about Lou Torok and information about Mother Teresa receiving the Bellarmine Medal in from Bellarmine College (now Bellarmine University) in India in 1981 and coming to Bellarmine to speak in 1982. For videos of Mother Teresa's visit to Bellarmine University, visit: bellarmine.edu/motherteresa/. This Sub-Section is divided into records series. It shares a box with Sub-Section I.2. Materials were accessioned and described in 1998. Arrangement and description by Theresa H. Sandok, O.S.M. Prepared for the web and updated by Mark Meade in 2016.